Known as the pearl of the Indian Ocean, Sri Lanka is a wondrous island endowed with a plethora of resources such as an bundant biodiversity, rich culture, great history, varied landscapes and many more. However, when we talk about the wildlife of the island, it is the jumbos that come to mind at once. An iconic constituent of the country’s wildlife, elephants have over thousands of years been living in Sri Lanka where they have been revered for centuries. What’s more, it is Sri Lanka that cares for the world’s largest herd of orphaned elephants. So, if you have planned a trip to Sri Lanka, you will without a doubt take home fond memories of these gigantic yet gentle mammals. Globally there are mainly two extant species of elephants – the African elephant (Loxodonta) and the Asian elephant (Elephas maximus), but after recent extensive studies and DNA testing, the African elephant was further subdivided into two distinct species called African bush elephant (Loxodonta africana) and African forest elephant (Loxodonta cyclotis). The Asian elephant falls into three distinct subspecies: Elephas maximus maximus (living in Sri Lanka), Elephas maximus indicus (living in mainland Asia), and Elephas maximus sumatranus (living in the island of Sumatra). All these species of elephants are of the Elephantidae family and The Proboscidea order. However, the largest of the Asian elephant’ genus, Elephas maximus (Linnaeus, 1758) is found only in Sri Lanka and it is a distinct subspecies of the Asian elephant while thought to be closely related to the Indian elephant. When compared with the African elephant, the Sri Lankan elephant is smaller in size but more attractive in appearance. It possesses smaller ears with dorsal borders folded laterally. The skin of this species is relatively smoother and darker with larger and more distinct patches of depigmentation on ears, face, trunk and belly. They have two humps on their forehead and the back is arched and convex while the trunk is more rigid with less rings ending in a single lip, a finger-like projection with which it can scoop tiny objects up. Lighter in weight, weighing between 2 and 5.5 tons, an adult male of the Sri Lankan species stands from 2.5m to 3.5m tall at the shoulder. Inhabiting tropical forests of the island, mainly lowland dry deciduous woodlands, scrubs etc. and frequenting nearby grasslands and cropped lands, the Sri Lankan elephants, whose lifespan lies between 55 and 70 years, travel in cohesive herds that consist of about 8-12 individuals especially female adults and their offspring headed by the matriarch, but herd sizes can vary. Anyway, males who leave natal herds when they reach sexual maturity can be sighted wandering on their own or in temporary bachelor herds. Their cohesiveness is enforced by a complex communication system. A range of vocalizations, from low rumblings to high-pitched screams and trumpets, along with assorted visual signals is employed when they are close to each other. Some of their rumbling, growling, bellowing, and moaning sounds of varied low frequency may travel long distances. These herbivorous proboscideans, that wander miles a day mostly in search of food and water, feed on a wide variety of vegetation including grasses, leaves, climbers, shoots, barks, roots, fruits, nuts and seeds and a large number of plant species have been identified to be fed on by elephants in Sri Lanka. Besides, an adult elephant can consume up to about 300 pounds of vegetation on a day. A female elephant usually becomes reproductive when she reaches about 9 – 12 years of age and can calve every 2 1/2 to 4 years, while less favorable conditions includes 5-8 years allowing for about 7 offspring during her lifespan. Males become sexually mature at about their 14th — 15th year, sometimes at the age of 9 years, but bulls do not mate until their twenties due to social hierarchy. Cows come into oestrus every 3 months, during which they are receptive to mating. When a female becomes pregnant, her oestrus cycle halts and she does not mate. Soon after she calves, her oestrus cycle begins again and she mates even if she is nursing. Anyway, after a 22-month gestation period, the longest of any mammal, they give birth to a single calf (very rarely twins) which weighs between 75-115kg standing 2.5-3.5 ft tall. A baby elephant that may consume about 12 litres of milk a day is taken care of not only by its mother but also by other cows in the herd whilst being weaned usually between 2 and 4 years of age. When referring to males, it is the oldest and largest ones that do most of the breeding during any time of the year. Bull elephants tend to breed during “musth” because during this period they become sexually active as well as extremely aggressive. Furthermore, Sri Lankan elephants are highly intelligent, self-aware, social, emotional as well as strong. It is reported that they move to safer places when natural disasters occur. A classic example is that in 2004 when the tsunami hit the island, elephants that were roaming in the coastal areas at the time had moved inland moments before the tsunami reached after sensing the looming calamity. These emotional beasts express their emotions using their trunk, ears, head, and tail. Also these species can easily be tamed and is capable of working under human instructions. 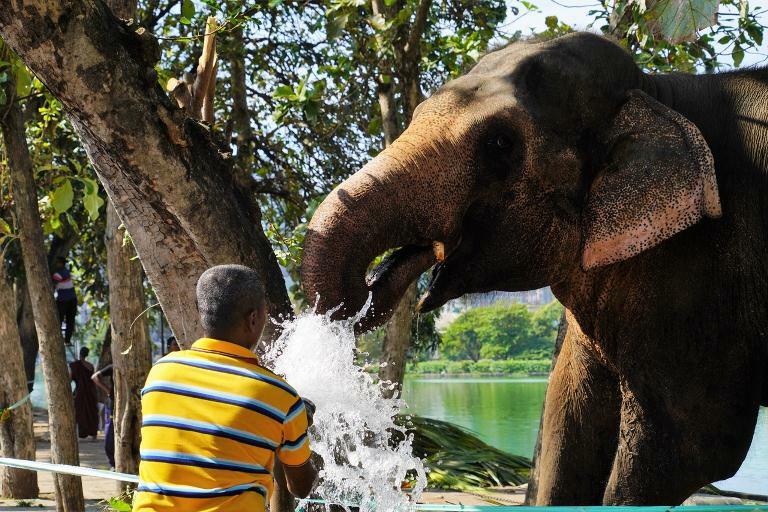 In Sri Lanka, elephants have been domesticated and used for various purposes over thousands of years. These powerful beasts have been used for transportation of people on their back, carrying, hauling and lifting logs and other heavy objects like stones used for construction purposes. In addition, these majestic proboscideans have been used for religious and cultural as well as other ceremonial occasions and this human-elephant relationship dates back to a period of over 5,000 years. 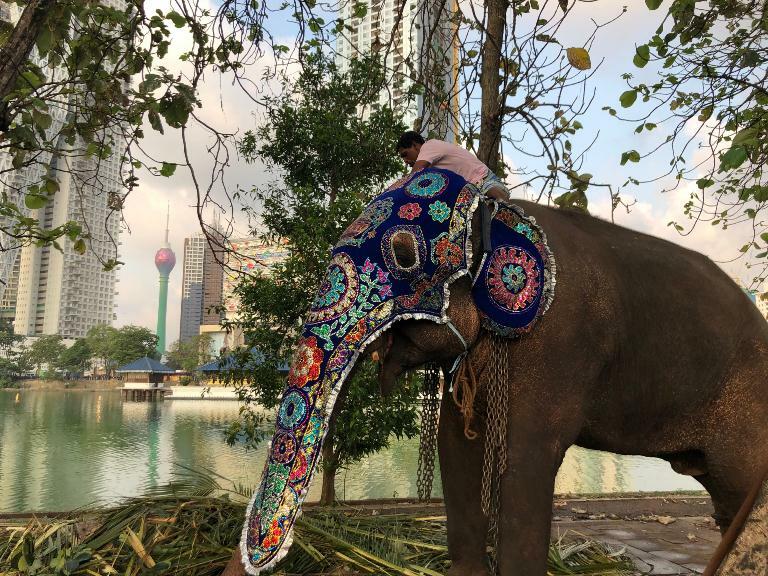 Currently, in Sri Lanka elephants are mostly used for ceremonial occasions while they are rarely used for hauling and heavy labour. 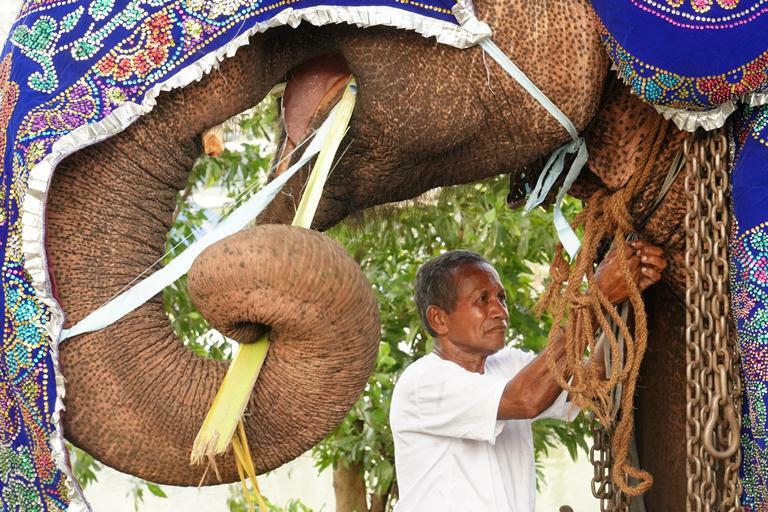 elephants, colourfully decorated in elegant costumes, are a common sight in Buddhist festivals especially Peraheras (processions) held by Buddhist temples all around the island. Among these grand festivals, the “Kandy Esala Perahera” is the most well known festival in which a large number of nicely adorned majestic march along. The most magnificent tusker (usually the longest-tusked) carries the casket of the Sacred Tooth Relic with pride and dignity, an opportunity enjoyed by only a few tuskers in Sri Lanka. This procession is annually held by the Temple of the Sacred Tooth Relic in Kandy since ancient times while it is the grandest and the most popular not only locally but internationally as well. 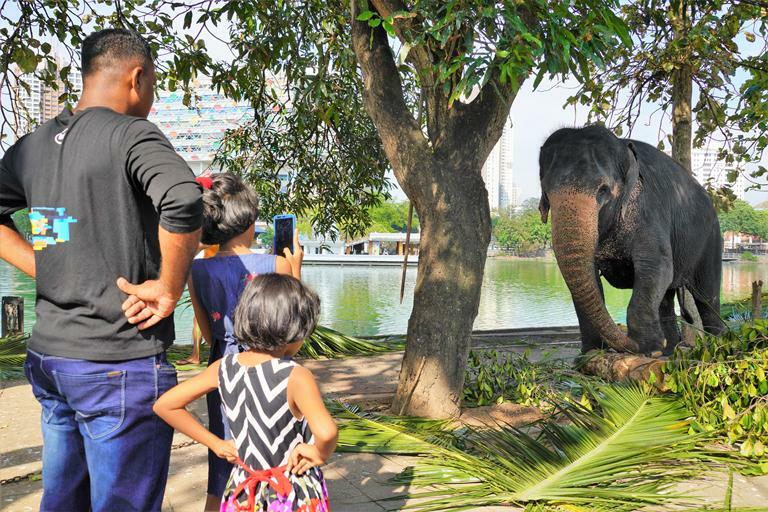 Moreover, the elephant has today become part and parcel of Sri Lanka’s ecotourism. The most unique feature of this animal is its tusks which give a sense of true majesty above other animals. The tusks are being used for various tasks. It is their incisor teeth that develop into tusks which grows up to about 6 feet throughout the animal’s life and elephants are usually right- or left-tusked as humans. The Sri Lankan elephant’s tusk which is slimmer and lighter can weigh up to about 35kg. Of the Sri Lankan elephants, only the bull has long tusks, though many bulls have no tusks at all. Cows have short tusks usually hidden under their rashes. The only other teeth they have are four molars that are replaced seven times throughout their lives. As the animal ages and the teeth are worn away with use, they are replaced from behind with the next set. If an elephant lives long enough to have used up all of its teeth, it then may starve to death. Anyway, of Sri Lankan elephants only a few bear tusks and the tusker population in Sri Lanka stands at less than 3% of the total population of elephants. This gigantic herbivorous mammal needs a large amount of habitat as they need enormous quantities of food and water to sustain their massive bodies, but unfortunately they are currently threatened primarily by the loss of habitat, in addition to habitat degradation and fragmentation. Deforestation for human settlements and cropping, leads to the loss and increased fragmentation of the elephant habitat in Sri Lanka. Every year in Sri Lanka, nearly 120 wild lephants are killed by people in order to protect their crops and houses and also to hunt for ivory. However when elephants roam to settlements and are not often killed, in return about 65 people die annually after being attacked by elephants. These numbers of deaths may be higher in certain years, with about 160 jumbos being reported to have been killed in 2006 alone. Besides, this human-elephant conflict is compounded by the elephant’s predilection for crops, such as sugarcane, bananas and other fruits grown by farmers. Even during the 19th and 20th centuries, elephants of this island had undergone very pathetic circumstances. During British rule, Sri Lanka lost a remarkable percentage of her elephant population; Major Thomas Rogers, famously known as “1400 & lost count”, had ruthlessly killed over 1400 elephants including more than 60 tuskers, at least one jumbo per day until he was killed by a stroke of lightning. In addition, during the same era, Major Thomas Skinner and Capt Galway had gunned down over 600 and 700 jumbos respectively for their sporting pleasure. Anyway, according to the elephant census carried out in 2011 by the Wildlife Conservation Department, Sri Lanka is home to 5,879 elephants out of which 1,107 are babies and 122 are tuskers. However, centuries ago this island had been inhabited by oodles of elephants, but when we look at the current elephant population, we can understand the extent as to why they are endangered by today. Hence, conservation of these valuable animals is a sine qua non of time. However, tourists who travel to Sri Lanka can have a memorable experience of these gigantic proboscideans of the island. They can enjoy watching, photographing and riding on elephants, in addition to going on elephant back safaris in national parks. Sri Lanka’s main national parks where tourists can watch Sri Lanka’s iconic giants of the wild include: Yala National Park,Minneriya National Park, Kaudulla National Park,Wasgamuwa National Park, Wilpattu National Park, Gal Oya National Park,Udawalawe National Park, andLahugala Kitulana National Park. Minneriya, Kaudulla, Udawalawe and Yala National Parks are more popular for elephant back safaris. The Elephant Transit Home at theUdawalawe National Parkis also a fantastic place to watch elephants. Here, orphaned elephant babies are rehabilitated and then released back into the jungle after they become strong enough to survive in their natural habitat. Yet another fantastic place to experience the earth’s biggest land mammals is the world famousPinnawala Elephant Orphanagethat cares for nearly 90 orphaned elephants, the world’s largest herd of captive elephants. Tourists have the opportunity not only to observe the entire herd bathing in the river but also to feed them with fruits and milk. The difference between the elephant transit home and elephant orphanage is that elephant orphanage does not release elephants back into the jungle whereas the transit home releases them.